Unparalleled brightness at the maximum aperture of F0.95, optimizing the performance at low lighting intensity. WIDE2.8mm, achieving the horizontal field angle of 99 degrees (when used on 1/3 cameras). 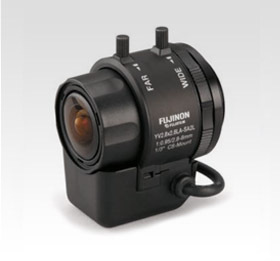 Compact and lightweight design, best suited for the use with dome cameras. High accuracy aspheric lens adopted, achieving the high quality image. Built-in ND filter of T360, supporting high sensitivity cameras.